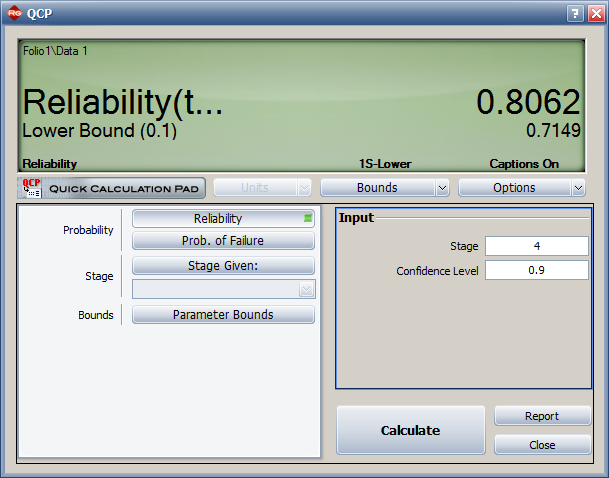 This continues the series of articles, initiated with the Reliability Basics article in Issue 81 of Reliability HotWire, discussing success/failure data in the context of developmental testing reliability growth analysis. In this month's article, we continue the discussion by highlighting the Lloyd-Lipow model, available in RGA, and show its application to model success/failure data as well as data sets that consist of reliability values at different times or stages. 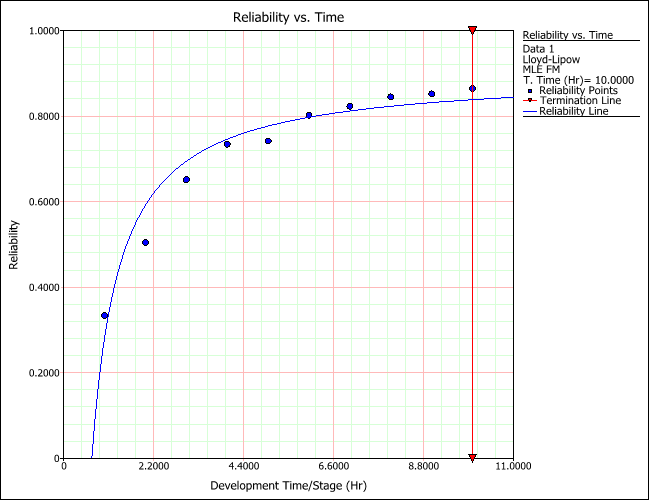 Rk = the estimated reliability during the kth stage of testing. R∞ = the ultimate reliability that would be attained if the new prototypes were continuously improved and tested (i.e. when k → ∞). α = is a parameter that modifies that rate of growth. If the data set consists of reliability data, then R'k is the observed reliability. The parameters of the model can be estimated using the maximum likelihood method or the regression method. 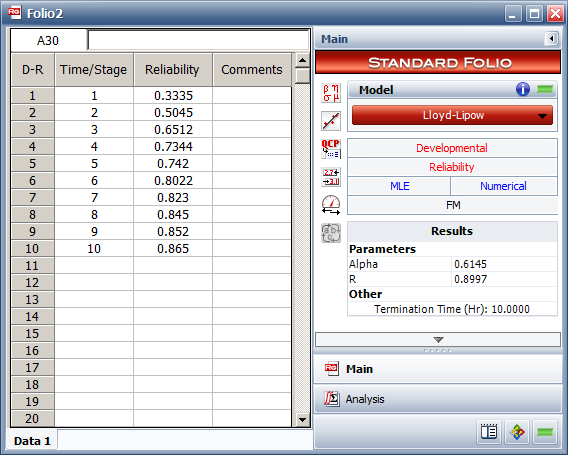 For more information about the parameter estimation of the Lloyd-Lipow model, click here. The confidence bounds on the parameters and Rk are computed using the Fisher Matrix method (for more information, click here). A one-shot system undergoes reliability growth development testing for a total of 68 trials. Delayed corrective actions are incorporated after the 14th, 33rd and 48th trials. From trial 49 to trial 68 the configuration is not changed. The goal of the developmental growth program is to demonstrate that the system achieved an 80% reliability with 90% confidence. The test results are shown next. The next figure shows the data set entered in RGA. Note: RGA allows entering the number of tested units and failures data in a cumulative or non-cumulative fashion. 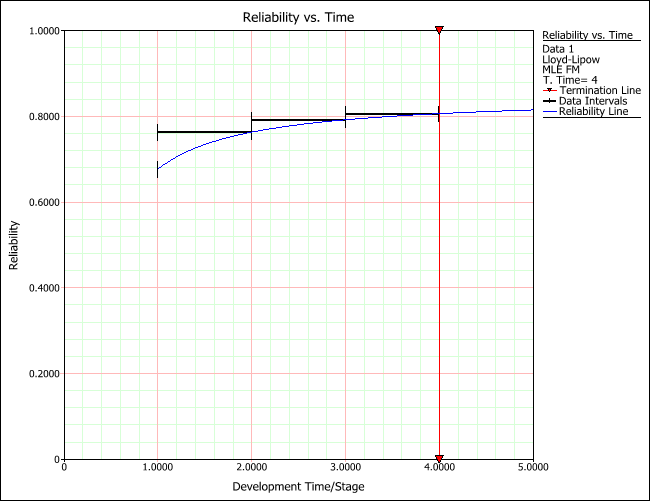 The following plot shows the reliability growth plot across the different configurations (stages of development). The achieved reliability at the end of the 4th configuration testing is estimated to be 0.7149, with 90% confidence, as shown in the next figure. The amount of testing and improvements performed up to this stage did not demonstrate the reliability goal. However, the ultimate reliability that can be potentially achieved if improvements continue with the same growth rate, R∞, is 0.8494. Therefore, the developmental growth testing program has the potential of achieving the reliability goal. The following calculation predicts that, with 90% confidence, the reliability goal could be reached after about the 10th new configuration. 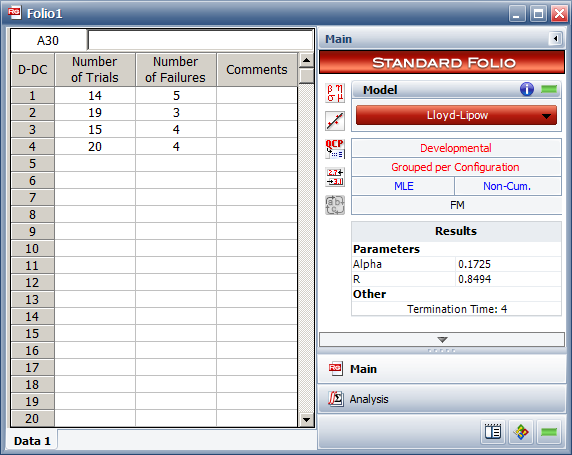 This example deals with the estimated reliabilities obtained for 10 stages of the development of an automotive product. The reliability values were calculated from times-to-failure data obtained through an accelerated test. The goal of the reliability growth program is to achieve an 80% reliability with 80% confidence. The following figure shows the data entered in RGA. The following plot shows the reliability growth plot across the different stages of development. 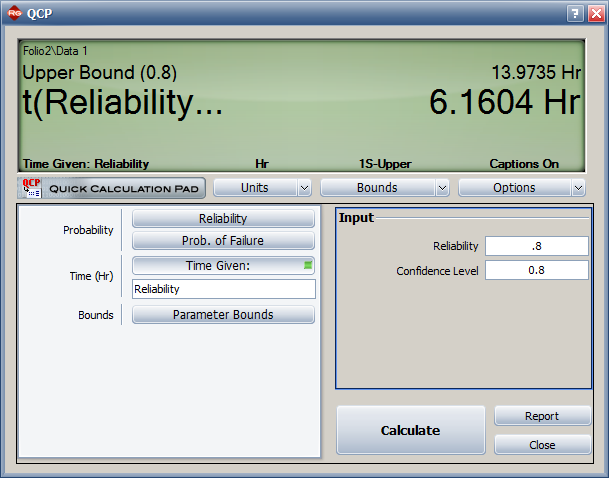 The achieved reliability at the end of the 10th configuration testing is estimated to be 0.7197, with 80% confidence. It can be predicted that the reliability goal of 80% with 80% confidence can be achieved after about the 14th improved configuration. These calculations are illustrated in the next figures. This article explained the Lloyd-Lipow model, available in RGA, and showed its application to model success/failure data as well as data sets that consist of reliability values at different times or stages. Examples were also presented to illustrate how the model is fitted and how to calculate some metrics useful in demonstrating a reliability goal or predicting the additional amount of testing needed to achieve the reliability goal. 1- Lloyd, D. K., Lipow, M., "Reliability Growth Models," Reliability: Management, Methods, and Mathematics, Prentice-Hall Space Technology Series, Prentice-Hall, Inc. Englewood Cliffs, New Jersey, pp. 330-348, 1962. 2- Nelson, Wayne, "Applied Life Data Analysis," John Wiley & Sons, New York, New York, 1982.